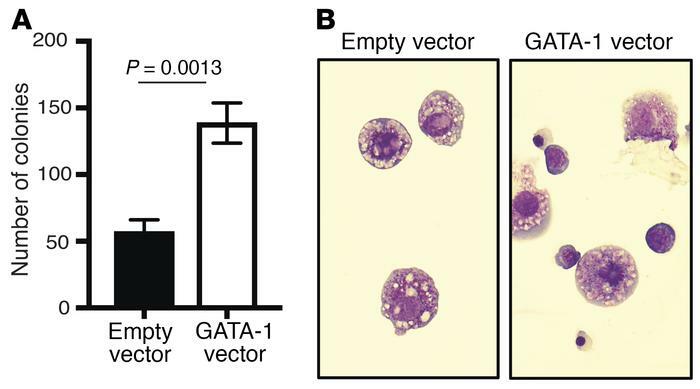 GATA1 overexpression rescues erythroid phenotype in Rnh1-deficient yolk sac cells. (A) Total number of colonies observed in control and GATA1- infected Rnh1-deficient yolk sac cells that were cultured for 7 days in methyl cellulose medium (n = 3). Data are shown as mean ± SD. P values were determined by 2-tailed t test. (B) Cytospin images of erythroid cells derived from methyl cellulose colonies of control and GATA1-infected cells. More mature erythroid cells were observed in GATA1-infected cells. Original magnification ×400.